Mt Patuhu is located southwest of Bandung, Kawah Putih is a lake on this mountains is sometimes pale turquoise, or as it's name says white. The direction is drive to Ciwidey. Kawah Putih can easy be reached by car all the way to the rim and then it is a 100 metre walk to the lake it self. It is a very nice colorful lake. Far to the south of Bandung, the hill becomes greener. The fresh air flows through the bamboo trees marching along the way. Kawah Putih, The White Crater, is waiting for who want to contemplate there. Two craters adorn the summit of Patuha Volcano. The dry crater of Kawah Patuha lies 600 meters northwest of Kawah Putih, a crater lake with approximately 8 meters of water depth. Kawah Putih Crater Lake represents a relatively stable volcanic system, with no records of magmatic or phreatic activity since A.D. 1600. Surrounded by the tea plantation, Kawah Putih is a very prospectors tourist's destination in West Java - Indonesia. 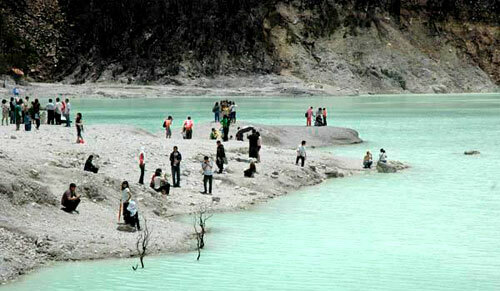 Located at about 30 km to the south of Bandung, Kawah putih is relatively easy to be reached. But, driving bu your own car is recommended, it's convenience because along the way, you can stop by to just take a rest, or buy strawberry, which can be easily found in this area. Fresh and considerably cheap.